Survival Mom has published an excellent article, “STOP! Don’t Throw Away These Treasures!” over at thesurvivalmom.com where she discusses how to convert some of your trash items into survival and emergency tools and equipments. Most preppers practice converting these trash items into items that are useful during a survival situation before they actually need to use them. Stop! Don't Throw Away These Treasures! Turn Your Trash Into Treasures. Storage and preparation can both be pretty expensive. It would be a shame to throw away items that would save us money when you can turn your trash into treasures, but that’s what we do every day. Many items that we throw out can be used to create tools and even appliances that we could use in our storage, while camping and in emergency situations. Turn Your Trash Into Treasures. Soda bottles are great for storing water in, but that isn’t all they are good for. They can be cut into other tools as well. 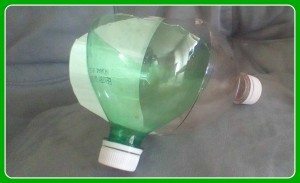 Just cut the top half off and turn it upside down and that soda bottle can become a funnel. You can also cut it into a scoop. The top can be used as the scoops handle. Use different sized bottles to get different sized funnels and scoops.